Kos is a small Greek island next to Turkey. Kos represents Europe for the Syrian refugees escaping from sure death because of the civil war happening in their native country. Migrants prefer to risk their lives crossing the sea separates Turkey from Europe. Women, children, men spend hours on flimsy rafts. Desperation brings people to take hard decisions. This is a strong image about migration happening in the Mediterranean area in these recent years. When I saw this image for the first time, I could not avoid to recall the composition of Dorothea Lange’s “Migrant mother.” In the image Lange took in Nipomo, California, in 1936, a mother is looking to the left with two of her children bent on her shoulders and a baby on her lap. She is concerned about the future and the gesture of her right hand almost touching her lips support this feeling. She is not sure about what is going to happen to her children and to her. In Daniel Etter’s image of the Syrian migrant, we see a specular structure of Lange’s photograph. 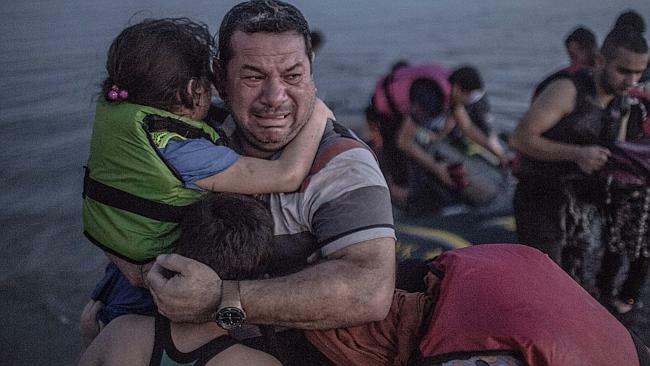 A father is protecting his children as soon as they get out of the boat. There is a strong sense of composition. He is not looking at the photographer, he is looking far at an uncertain future, but, unlike Dorothea Lange’s image, he is crying. The general feeling we have about the situation, then, is quite different: this man is not mainly concerned about what is next. He is crying because his family made it, all of them reached safely this Europe’s shore. He cries tears of relief. What is the role aesthetics played in the success of this image? Was the photographer influenced by Lange’s image of the “Migrant mother”? It is complicated to answer to these questions. Daniel Etter is a freelance photographer, writer and videographer graduated at the German School of Journalism and it seems hard to think that he hasn’t ever seen such an iconic image as the “Migrant mother” is. I am not saying that he imitated the composition aspects. I am only assuming that our cultural background influences our choices unconsciously when we frame reality to produce an image. This image has been shared hundreds of thousands of times on social media and became viral with over 50,000 shares. In these days when an ocean of images is filling our lives, it is fundamental that we are aware of what we document and publish. Lessons from the past should be welcome in order to make sure we are able to deliver the right message. It doesn’t matter if the composition is suggested by a masterpiece from the past. After all even Michelangelo was inspired by classical Greek sculpture.